PTC Punjabi's Talent Hunt Show Mr. Punjab all set for the Grand Finale whichi is going to happen at Dusshera Ground, Mohali at 6.45 Onwards. 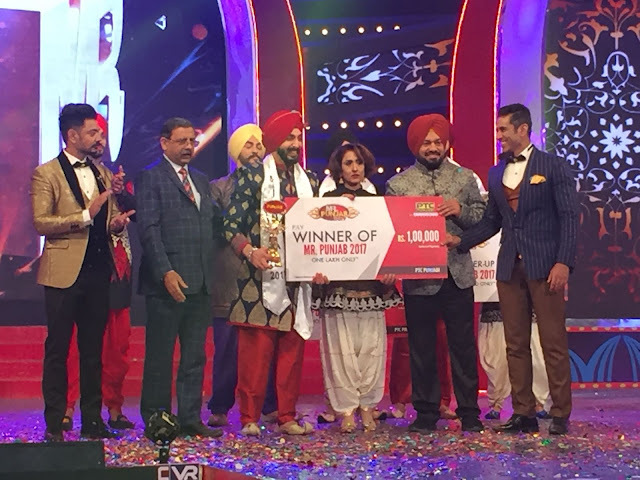 See Who is the Winner of Mr Punjab 2017 Grand Finale. Several talented Punjabi Celebrities, Singers and Actors will grace the Grand Finale and makes it very special night. Keep Watching this Space for all the Live Updates from Mr. Punjab 2017 Grand Finale Live. Jaspreet Singh, Mahakdeep Singh, Hartajveer Singh Gill, Arshbir Singh, Ravneet Singh Sikhon, Tarlok Singh, Gurpeer Singh Mann, Harpawit Singh, Parminder Singh, Jaspreet Singh Chappa competed to win the Title of Mr Punjab 2017. The Public Voting results will be revealed here and Mr Punjab 2017 Winner of PTC Punjabi revealed. The Punjabi hunk Harpavit Singh won the title of Mr Punjab 2017 in Grand Finale event at Dusshera Ground, Mohali the prize the prize money of Rs 1 Lakh. Wherein Arshbir Singh won the first runner up title, Tarlok Singh from Mohali and Ravneet Singh from Mumbai won the Second Runner-up title. Although, it was a tough competition between 10 finalists and all the participants gave their hundred percent while performing. Four out of ten contestants including Gurpreet Singh Maan, Jaspreet Singh Chappa, Jaspreet Singh and Mahakdeep Singh were eliminated after the 4th round. The grand event got the overwhelming response, as one of the most popular Punjabi singers and artists of Punjab performed at the event. The line-up of stars included Jazzy B, Sunanda Sharma, Kulwinder Billa, Nisha Khan, Kadir Thind, Roshan Prince & Gurmahik Singh Sidhu. Mr. Punjab 2017 Winner Name and Runners Up Names revealed Here. Meanwhile you can comment and let us know who is your favorite contestant of Mr. Punjab 2017.